When warmer spring weather arrives, Canadians fire-up their barbeques to grill juicy burgers, head out to their neighbourhood ice cream shop for a double-scoop, or cool off with an iced cappuccino at their local coffee shop. While these foods may seem like ideal warm weather treats, they’re almost always higher in heart unhealthy saturated fat, sugar, salt, and calories. This spring why not consider turning over a new leaf and indulge in a heart healthy diet instead? Not sure where to begin? Embrace these simple steps and you will be on the right track to ‘spring cleaning your diet’! 1) Be sure to include good fats in your diet for optimal health – It may surprise you to know that not all fat is bad. Saturated fats and trans fats are referred to as ‘bad fats’ as they can raise bad/LDL cholesterol levels. High cholesterol is a risk factor for heart disease. Unsaturated fats are known as ‘good fats’ which come in two varieties, monounsaturated and polyunsaturated varieties. In fact, Becel® margarine is a source of Omega-3 polyunsaturated fat, part of the Good Fats Family. Other sources of good fats include avocados, nuts and seeds, vegetable oils, and fatty fish like salmon. Replacing saturated fats with polyunsaturated and monounsaturated fats from vegetable oils helps lower cholesterol and protects your heart. Cook from scratch: control the amount of salt and sodium added to the recipe. Use sodium-reduced and salt-free ingredients: experiment with salt-free seasonings such as ginger, garlic, black pepper, basil, dill, lemon or lime juice, and various herbs and spices. Compare Nutrition Facts tables: look at the serving size and sodium level on similar products and opt for the one that contains less sodium per equivalent serving size. Artichokes are an excellent source of folate and both fibre and potassium. Not to mention they’re tasty on pizza and pair well with any chicken dish. Asparagus provides a source of potassium, magnesium, selenium, and iron. You can roast, steam, or leave the spears whole, and they’re delicious in an omelet or as a side dish. Kale is an excellent source of Vitamin C and is filled with lutein and beta carotene, which can help you maintain a healthy diet this spring. 4) Craving a sweet treat? – Tame your temptation by using a treat budget. Instead of depriving yourself, limit higher-calorie treats to twice a week. When choosing a sweet fix, remember lighter options like low-fat frozen yogurt and ice milk frozen desserts, or a fruit smoothie made with fat-reduced yogurt and mangoes or berries and fruit as another tasty choice. Remember to opt for fresh or frozen fruits that have no added sugar. Start your meal off right with a simple salad or a small cup of broth-based soup. Order half portions or lunch-sized servings when possible. Ask for salad, raw vegetable sticks, or steamed vegetables instead of fries. Look for items on the menu that are broiled, baked, grilled, steamed, or poached. Avoid deep-fried or breaded options. Ask for dressings and sauces on the side, and make it a rule to use less than you are given. 6) A spring barbeque on your menu? – Keep calories to a minimum by barbequing skinless chicken or salmon. For healthier burgers, try ground turkey, Portobello mushrooms, or a lean bison burger. Serve mixed vegetable kebabs or slow roast some sweet potatoes in foil. Top off your meal with a green salad, fruit salad, or cut up raw veggies – think carrots, celery sticks, and cherry tomatoes. Gina Sunderland is a Winnipeg-based registered dietitian and a specialist in nutrition education and assessment. She has worked across Canada and specializes in translating scientific nutrition information into easy to understand messages for Canadians. Her goal is to make nutrition and eating healthy, fun, understandable and easy! 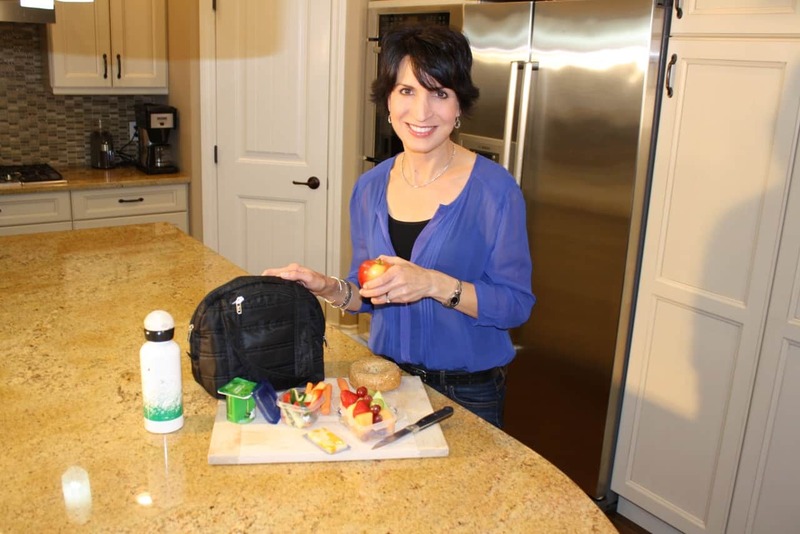 Gina developed this Spring Clean Your Eating Habits article for the Becel® brand, for whom she acts as a spokesperson. Visit Becel.ca for more nutrition and healthy eating tips.